How Risky Is Royal Dutch Shell's Stock? Despite its massive size and vertically integrated business model, there are still some risks that anyone invested in Royal Dutch Shell should consider. Image source: Royal Dutch Shell via Flickr. Investors looking for some form of stability over the long term have turned to integrated oil and gas stocks. Their ability to throw off gobs of cash and pay generous dividends over time has been a pretty attractive proposal. One thing that makes investors in these companies nervous is when the market for oil and gas tanks, or when one of these companies makes a transformative acquisition. Royal Dutch Shell (NYSE:RDS-A) (NYSE:RDS-B) is in the middle of both right now. With Shell working through the BG merger while the energy market is working through one of its toughest periods in recent history, some might be curious as to how risky Shell's stock is today. Let's take a quick look at the two biggest risks for shareholders today. An over-promise on the dividend? Over the past couple years, as oil prices have declined, dozens of companies across the space have been forced to preserve cash by cutting dividends. The one last bastion where dividends have remained consistent is with integrated oil companies. Having assets across the entire value chain of oil has helped to make up for the massive losses experienced on the production side of the business. However, with oil prices this low, those Big Oil dividend payments are becoming rather onerous. 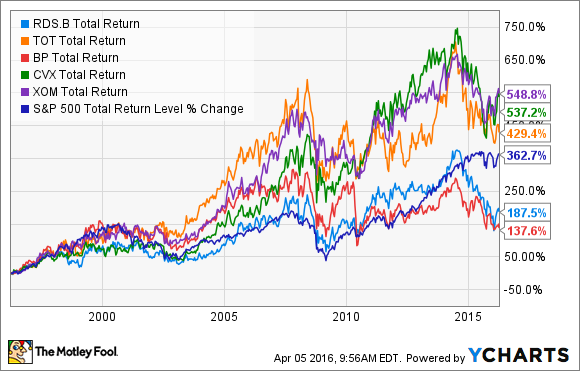 Dividend yields for almost all of these companies are at multi-decade highs, and with dividend payments at Shell and BP (NYSE:BP) pushing the 8% mark, there are questions about whether those payments can actually continue. 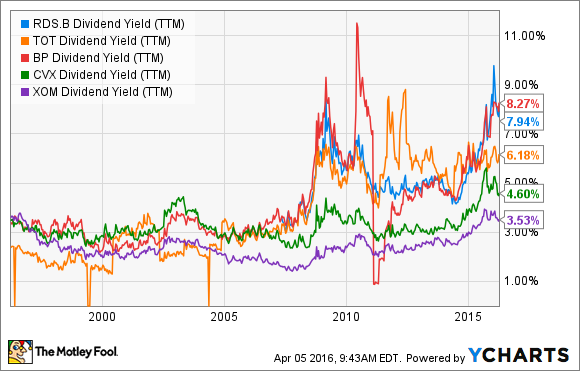 RDS.B Dividend Yield (TTM) data by YCharts. Shell's management has said on multiple occasions that its dividend is a priority, but we've heard many other companies say that and subsequently cut dividends. To help offset the more than $9 billion in annual dividend payments, Shell has enacted a scrip dividend program via which investors can take dividend payments in the form of newly issued shares. This will help to offset some of the cash outlays for the company, but that's typically only necessary when a company is cash-strapped. Another thing to consider is that now, thanks to the BG merger, Shell has a lot more shares that need to receive a dividend each quarter. Shell's dividend payment isn't something that will completely break the company. If the operating environment for oil and gas companies were to deteriorate much further, then Shell has the option to cut the dividend to preserve a lot of cash. From an investor's standpoint, though, a dividend cut would mean two things: 1) We would likely see a large price drop in the short term, and 2) those invested in Shell over the long term will generate much lower total returns. That's something the company can ill afford as its total returns over the past 20 years have wildly underperformed its peers, and it hasn't even been able to keep pace with the S&P 500. RDS.B Total Return Price data by YCharts. Typically, integrated oil and gas companies are rather risk-averse. To mitigate risk, they build balanced portfolios with production coming from a wide variety of sources so they aren't tied too closely to a single market. That is why it's a little surprising to see Shell make two pretty concentrated bets on LNG and deepwater production. By acquiring BG Group, Shell's LNG production will be more than double that of the next-largest LNG producer, ExxonMobil (NYSE:XOM). Looking even further down the road, Shell has another large suite of LNG projects under consideration that could expand Shell's lead in LNG over the next decade. Image source: Royal Dutch Shell investor presentation. Another realm in which Shell is doubling its efforts is in deepwater projects, especially in Brazil, where BG Group has sizable investments over the next few years. Image source: Royal Dutch investor presentation. The reason these investment plans stick out is because they are very much the same kind of investments that -- some say -- got big oil companies in trouble over the past couple of years. These multibillion-dollar projects with long lead times mean there's very little wiggle room in capital spending budgets as oil prices wax and wane. So, it's a little surprising to see Shell double-down on these kinds of investments. Other companies, notably Chevron (NYSE:CVX) and ExxonMobil, have shifted more toward other investments such as shale, which have lower upfront capital obligations and shorter investment cycles. In doing so, they can make their capital spending budgets a little bit more responsive to current market conditions. This isn't to say Shell is wrong in making these kinds of investments. LNG could be a very lucrative market for it, and global demand for oil suggests that more deepwater production will be needed. However, by making more concentrated bets on LNG and deepwater rather than trying to balance its production portfolio with a more diverse stream, Shell exposes itself to a bit more risk than some of its peers. In the grand scheme of things, Royal Dutch Shell isn't what you would call a "risky" stock. As the world's second largest publicly traded oil and gas company, it has immense competitive advantages such as economics of scale and access to cheap credit in a capital-intense industry. When you compare Shell specifically to its peers, though, some aspects of its look slightly riskier than the others. Shell's decision to make concentrated bets on megaprojects (again) and the possibility of a dividend cut if market conditions were to deteriorate any more could really hurt long-term returns for investors. I can't fault investors who want to invest in Shell's stock because of the potential benefits, but there are better options in the integrated oil and gas space today that seem slightly less risky based on today's market.